It’s the month when green forests slowly turn orange, yellow and red, culminating with ghosts, ghouls and all things scary. Back by popular demand, Paranormal Pair takes you to America’s Most Haunted Hotel, the 1886 Crescent Hotel’s and the 1905 Basin Park Hotel for a two night stay experience. Explore the haunted hallways and stories that have stuck around the historic hotels with 2 tickets to the Crescent Ghost Tour where you will venture to the morgue. On your second night experience the Basin Park Hotel Ghost ADVENToUR where you can experience the adventure of a Paranormal Investigation with the thrill of a ghost tour. Exclusive access to both the rooftop crows nest and underground cave. Call-in only booking (877) 342-9766. This just in! Friday evening, January 12th, Dave Schrader, known to listeners all over the country from his Darkness Radio station and his frequent hosting of Coast to Coast, will be participating in ESP18 at the Crescent Hotel. Dave will be giving a keynote speech on Friday evening, January 12th, and also taking part in a round table discussion on Saturday 13th. Look for more details on this website and tune in to Coast to Coast, your nightly portal to the Unknown! 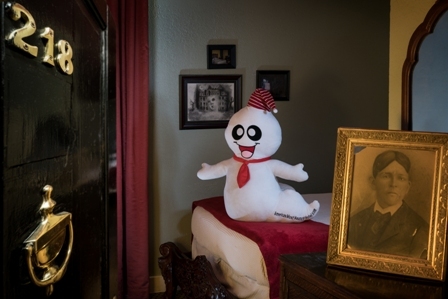 …is guaranteed during the month of October 2016 at America’s Most Haunted Hotel as every room -even Michael’s Room 218 (said to be the most active room in the hotel)- will have a “ghost” on the bed welcoming guests as they enter. We took the ghost tour Thursday evening, which was very interesting! We also believe we were visited by Breckie. Ever the skeptic, my husband was awakened by someone pulling on the bed sheets. He awoke from a sound sleep from the tugging and because of the chill that he felt run up his spine. This was around 1:00 or 1:30 a.m. After we had settled down and fallen back asleep, I felt the tugging of the bed sheet at the end of the bed. The first time it occurred, I thought it was my imagination because my husband had mentioned it. The second time I thought, ‘now that’s not my imagination’. The third time, I drew my legs up and drew the covers closer to me and it stopped. Just as I was falling back asleep, something began pulling on the end of my long hair. I also then experienced a odd chill up my spine. It occurred two more times, until I wrapped my hair into a twist and placed it under my neck. Then it, too, stopped. An experience we will never forget! The Place to Celebrate Halloween at America’s Most Haunted Hotel! $5 Cover at Door 8PM-11PM Live Entertainment by DJ Testube Costume Contest- Win a haunted trip back to Eureka Springs! Drink Specials and Lite Snacks.